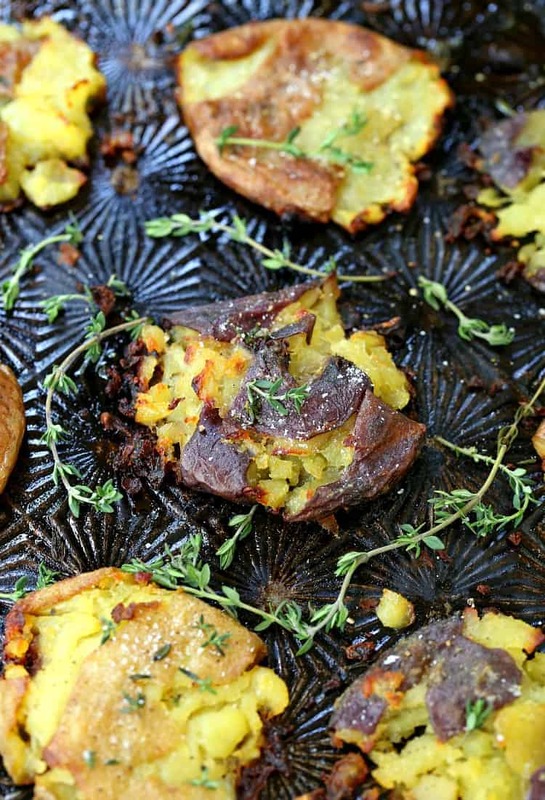 Once you make these Stick of Butter Smashed Potatoes you’ll never make plain potatoes again! 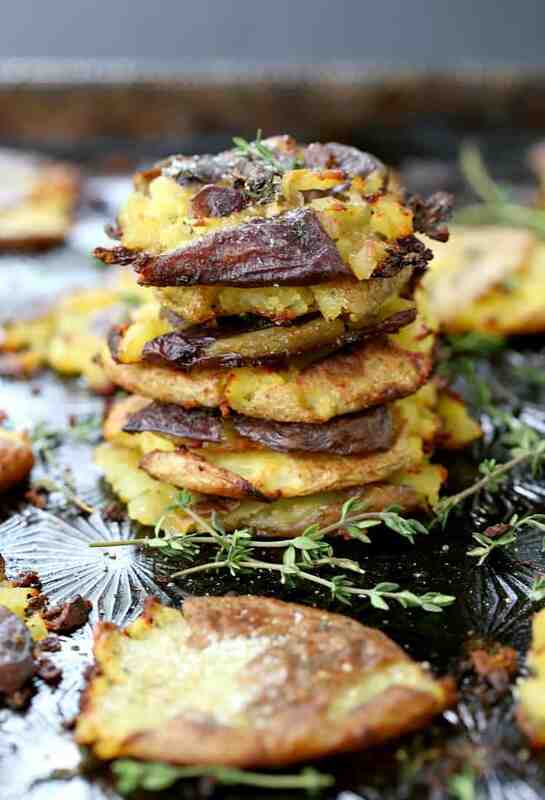 These are going to be a perfect side dish to any dinner! If you’re a meat and potatoes person like I am, then you’ve probably tried potatoes in all the ways shapes and forms possible by now. 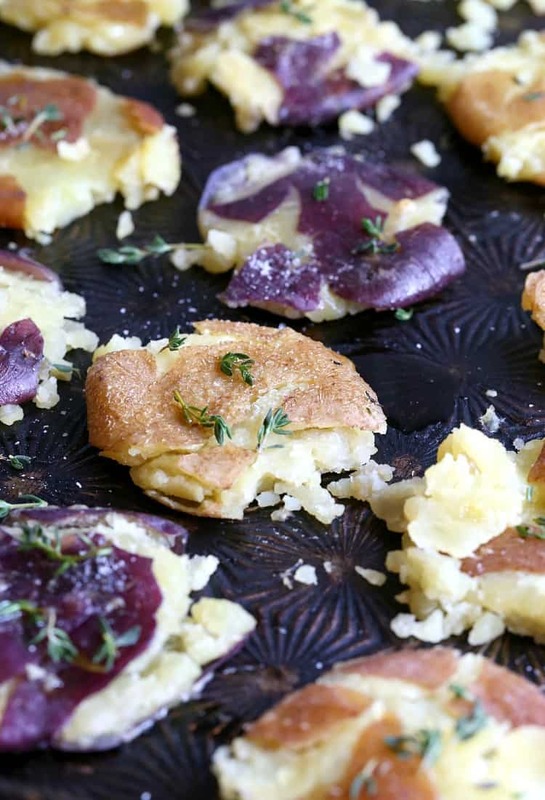 But I bet you haven’t tried these Stick of Butter Smashed Potatoes – because once you do – the potato game is over. These are definitely on the constant rotation now, we’re grabbing these little potatoes every time we go to the store, and trust me guys, that’s a lot. 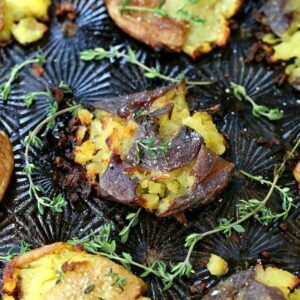 I love side dishes like these Stick of Butter Smashed Potatoes that totally take over the whole dinner. 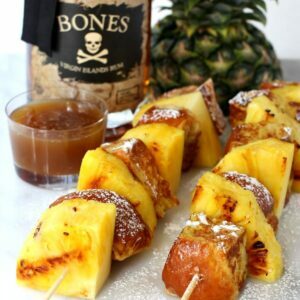 Usually side dishes are an afterthought to the main meal but when you get something like this Upside Down Pineapple Stuffing or Buddha’s Baked Beans recipe – it can make dinner a lot more exciting. 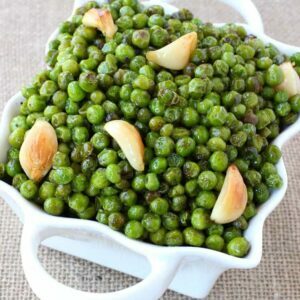 You can also make these ahead of time so if you are planning on having them as a side for a dinner party you can just crispy them up in the oven before you eat. So normally when you boil potatoes you just gill up a pot of water, add some salt and you’re on your way. Right? These Stick of Butter Smashed Potatoes get boiled in chicken broth and you guessed it – a stick of butter. The butter in the broth flavors the potatoes as they boil (and so does the broth instead of water) but you’re also going to use it to flavor the potatoes when they’re done, too. 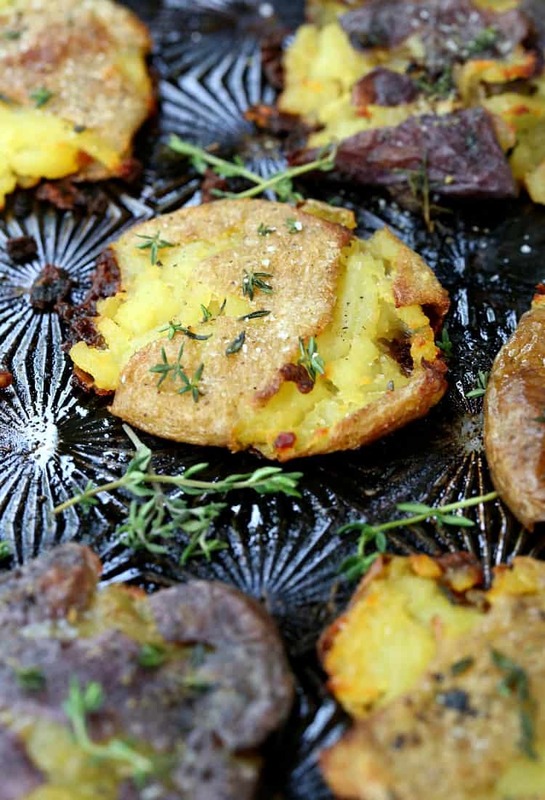 So boil the potatoes – let them cool a minute then smash them with whatever object you like. 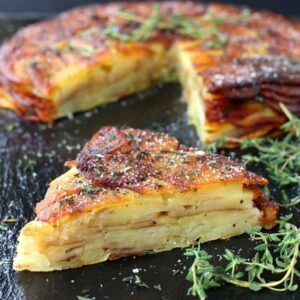 I used a thick bottomed glass but you could use a small pan or anything that has a flat bottom you can flatten the potatoes with. You can make them on the thicker side or the thinner side, I like them thinner and crispier but you do you. When you smash the potatoes they might stick to the glass, or even come apart a little but never fear. Just scrape it off and pile it back on your potato. It’ll all crisp up and stick together as it bakes. So before you get these smashed potatoes in the oven, you’re going to spoon the buttery, herby, chicken flavored broth on top of them so it all bakes right in. Get ’em in the oven for about 15 minutes, take them out and flip them over. Now more buttery broth and back in the oven. These Stick of Butter Smashed Potatoes are so crispy when they’re done you can pick them right up with your fingers and crunch on them…but maybe don’t. Because once you start you won’t be able to stop. 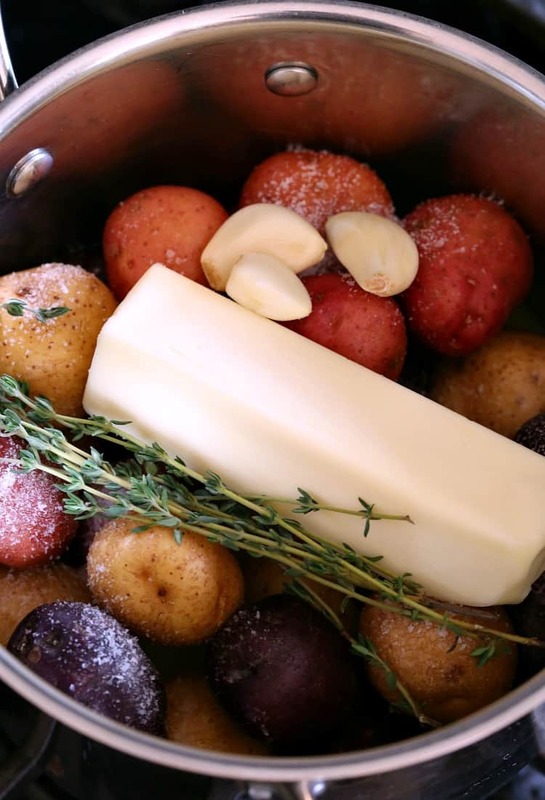 Add the potatoes to a pot along with the butter and chicken broth, garlic, salt and 4 pieces of thyme. The liquid won’t cover the potatoes completely, that’s fine. Bring to a boil then reduce the heat to a simmer. Partially cover the pot and cook for 20 minutes until the potatoes are tender. Remove the potatoes from the pot, saving the liquid. Place then potatoes on a baking sheet and press down with the bottom of a glass. If some potato sticks to the glass just slide it off and add it back to the potato. Repeat with all the potatoes. Season the potatoes with salt and pepper then drizzle the potatoes with some of the butter and broth mixture. Cook for 15 minutes, remove from the oven and flip the potatoes over. Spoon more butter over the tops and place back in the oven for 8-10 minutes. 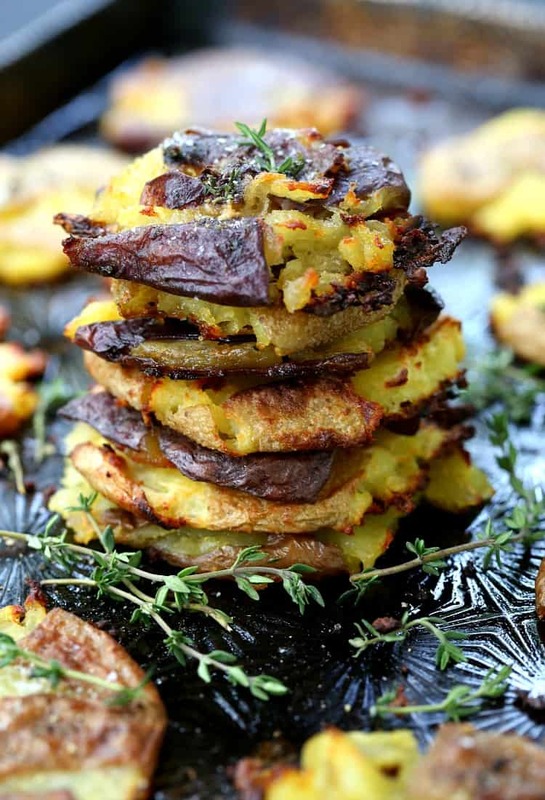 The cooking time will depend on how thin you’ve made the potatoes so when they’re in for the second bake just keep and eye on them to make sure they don’t burn. Garnish with more fresh thyme leaves and salt and pepper if desired.